ToolCube is a gadget for Windows. It says that it will put a box with all the useful links on your desktop, which means that you will be able to access them very quickly. This will help you save time and energy because you will be able to access games, news, sports, and much more easily and quickly. This program really makes many promises but we do not think that it is very trustworthy. This is because it shows ads and is known to be an advertising-supported application (adware). If you do not know anything about these programs, you should know that they only show commercial advertisements. In other words, you should not expect anything really beneficial from them. On top of that, there is a small possibility that their ads will cause harm to your PC. We do not think that you want to keep such untrustworthy programs on your system, so we have prepared manual removal instructions, which you will find below. Advertisements generated by adware programs are really annoying. In addition, it is known that they might redirect to untrustworthy web pages because there are third-party links integrated into each of them. Malware might hide on the websites, which look rather decent at first sight, so it is not so easy to say whether the website which you have been redirected to is trustworthy or not. ToolCube will not only show commercial ads, but might also collect information about your activities on the web. These include the websites you visit, the search queries you enter, the time you spend on particular websites, your IP address, approximate location, and much more. Even though ToolCube says that it collects only non-personally identifiable information, nobody can guarantee that that is true. Actually, it is always risky to keep untrustworthy programs installed, so we suggest getting rid of ToolCube as soon as possible. 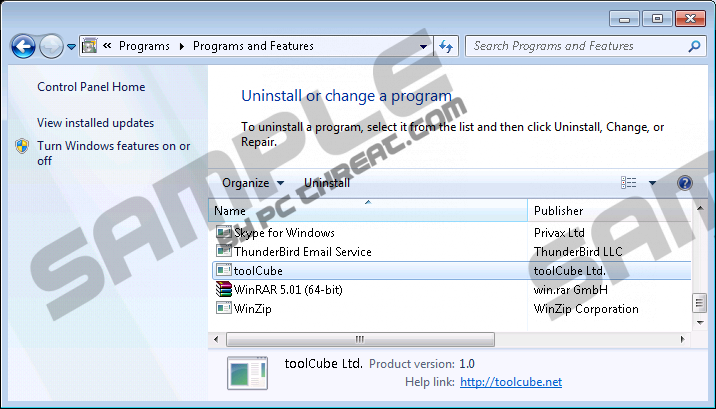 Unfortunately, there is a slight possibility that ToolCube travels bundled with other undesirable programs. These programs might have entered your system along with it, so that is why you cannot say when ToolCube was installed on your computer. There is a small possibility that unwanted programs that exist on your PC have downloaded ToolCube too. Therefore, we highly recommend that you scan your system with an automatic scanner in order to find out whether undesirable programs are really installed. If the scanner has detected many untrustworthy programs, make sure that you erase them all immediately. You should use SpyHunter for this matter – it will erase all the threats in the blink of an eye. ToolCube can be deleted via Control Panel. Thus, we have placed the manual removal instructions below this article. If you still do not think that you will be able to remove this program yourself after reading our instructions, you should acquire an automatic security tool. It must be reliable to be able to delete threats from your system. After you acquire a tool, you will only have to install it, launch the scanner, and scan your system. A trustworthy tool will protect your system from future threats, too. Right-click on ToolCube and then Uninstall it. Access the Metro UI menu and start typing Control Panel. Open it. Enter Control Panel in the search box and click OK. Select the application that you want to erase. Quick & tested solution for ToolCube removal.